Yesterday, we posted about a Nov. 4th Times of London review by David Aaronovitch of a new exhibit at the Jewish Museum in London titled Blood: Uniting and Dividing. We paid particular attention to this passage in Aaronovitch’s review. We demonstrated that Aaronovitch misrepresented the reason why, in the 90s, Ethiopian blood was discarded. The blood wasn’t, as he claimed, discarded for “no other reason than the race of the donors”. Rather, it was based on a failure by the blood services to update an earlier (medically sound) directive from 1984 which related to the fear of spreading Hepatitis B, Tuberculosis and Malaria. However, though it doesn’t appear as if Aaronovitch researched the issue before reaching his conclusions, we wondered if he was merely communicating what he saw at the Jewish Museum. Did the exhibit portray the Israeli row in the 90s as a case of racism against Ethiopian immigrants? We subsequently obtained the following email correspondence between the curator of the Jewish Museum and a follower of our blog, which helps to answer this question. 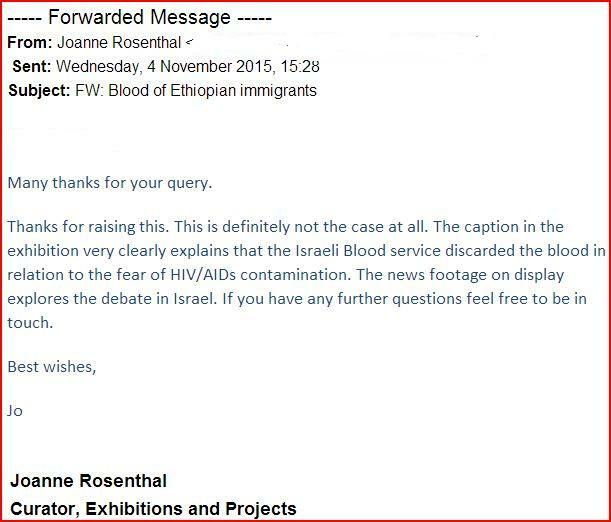 So, it seems like the Times of London journalist’s claim that racism explains the decision to discard Ethiopian blood wasn’t based on his own research into the case or the museum exhibit he ostensibly reviewed. At the very least, Mr. Aaronovitch clearly owes readers an explanation as to how exactly he reached his original erroneous conclusion. Ah yes, but of course the Israeli authorities were clearly racist, because they knew that all blood of such people is always contaminated by nasty diseases. It’s a well-known fact, so you don’t even have to state it in the caption. I don’t think you understand the Global blood donation rules. But then you don’t impress me as someone who has given blood. Sociopaths and other hate mongers aren’t known for their compassion. Do me a mitzvah and try to understand what I*R*O*N*Y is about. Your response is a perfect example of why, whatever Jews say, they are ALWAYS in the wrong. I wouldn’t call that Irony, Jan, but rather sarcasm. And if you can’t handle sarcasm on the Interwebz not being read as sarcasm by folks who don’t know you, on a message board filled with folks who, you know, like to not be sarcastic when blaming everything on the planet, including the subject matter, which is tainted blood vs racism, on Jews and Israel, then maybe you should avoid it? Just a thought. Or accept the criticism and move on. But you don’t want to do that. You want to create definitions for IRONY. Which is ironic. Don’t you think? Maybe a little TOO IRONIC? Ah, yeah, I really do think. It’s like raaaaaaaaain, on your wedding day! A freeee riiiide, when you already paid! It’s some gooooood advice, that you just can’t take! And don’t forget, the black fly in your chardonnay….. I think that indeed normally I would be careful how I used irony on a message board but in this case I assumed that most people reading my message on this particular web page would have the same background as I have (Ashkenazi) in which our bitter heritage is most usually expressed using irony. I really didn’t think it would be necessary to explain, my excuses that I didn’t make my intent clear in the first place. Yes Jan. Whatever you say, Jan.
Sarcasm or irony? Only you will decide. Of course it was irony, Jan. But you are not dealing here with someone who has a full deck. Well, this is pretty ironic. In many western countries to this day blood donations from active homosexuals, and from different ethnic groups are indeed rejected. This is common medical practice based on statistical percentages of HIV positive donations among certain groups being tens and hundreds of times higher than the average. This is because, as hurtful as it may seem, political correctness and people’s feelings have no room when it comes to preventing people from contracting a deadly disease. Period. I think he should in a form of apology donate blood to MDA. And we promise not to take it all. MDA stopped taking blood from British born immigrants after the outbreak of Mad Cow disease in the UK. This wasn’t racism against British immigrants – they just thought we were moo-shugah. 1. You beat me to it with your comment about blood donations from Brits. 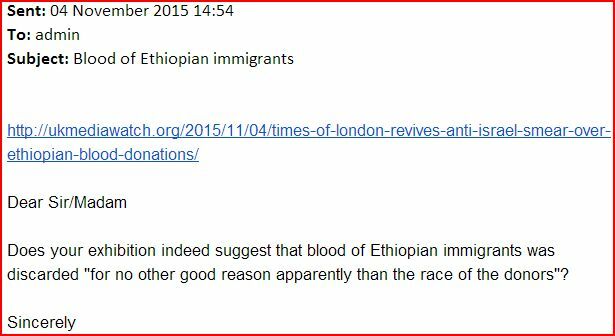 Unfortunately, on BBC Radio 4, hosted by Tom Sutcliffe just now, Saturday 7 November, he and his guests agree that it is ironic that the Israelis threw away the Ethiopian’ blood out of some kind of racism blahblah. I will have to go to the museum myself to find out exactly how this part of the exhibition is presented. I am depressed because I have a lot of time for Tom Holland who was one of the guests.